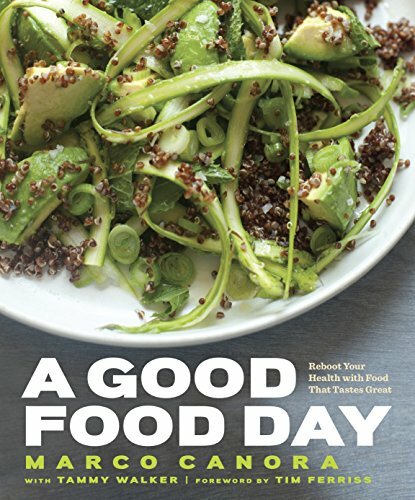 [PDF] A Good Food Day: Reboot Your Health with Food That Tastes Great | Free eBooks Download - EBOOKEE! Posted on 2017-12-10, by luongquocchinh. Description: WHAT IS A GOOD FOOD DAY? A day when feeling good and eating well go hand in hand. Imagine a whole day in which every meal was full of healthy and delicious ingredients. After years of thoughtless eating that led to weight gain and poor health, chef Marco Canora knew he had to make every day a good food dayâ€”but he wasnâ€™t willing to give up flavor for health. Instead of dieting, he decided to make simple, natural recipes fit for a food loverâ€™s palate. Marco explains the secret powers of good-for-you ingredients (such as low-GI carbohydrates and alkaline-forming greens), and then builds them into recipes that are all about satisfaction, such as Amaranth Polenta with Tuscan Kale, Black Rice Seafood Risotto, Citrus-Spiked Hazelnut and Rosemary Granola, and Chickpea Crepe Sandwiches. He covers techniques to coax natural flavor out of dishes, including infusing seasoning into vegetable salads and pounding fresh herbs and spices into lean meats. To make a lasting change in your diet, the food you eat has to be delicious. A Good Food Day is for people who love real food, and know that healthy and flavorful can go hand in hand. 2017-11-01[PDF] Juice It! Blend It! : Transform Your Health One Drink at a Time! No comments for "[PDF] A Good Food Day: Reboot Your Health with Food That Tastes Great".